Fractale aired on Fuji Television's noitaminA block. On June 19, 2011, Mutsumi Akazaki, who drew the manga adaptation of Fractale, stated in a blog post that she found the work 'uninteresting' and added that she wanted to work on a manga that she enjoyed. The blog post was soon removed. 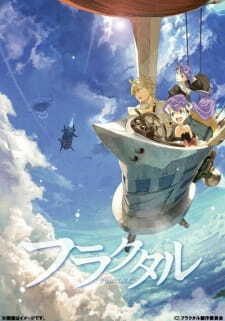 As a result, the anime's director Yutaka Yamamoto requested that the production committee discontinue the manga series, though there was no indication that this was approved. Akazaki later apologised for the remark. Fractale sets itself out as a sci-fi show set in a post-scarcity world where nobody inter­acts with each other because they can cre­ate dop­pels to do that for them. There­fore every­one lives in com­plete lux­ury in whatever set­ting with whatever types of people they choose to live with. It’s an inter­est­ing set­ting and one that Fractale occa­sion­ally explores but never attacks, almost as if they brought up that plot point by acci­dent and it has noth­ing to do with the overly­ing theme of the anime. Occa­sion­ally the show will come across a char­ac­ter who uses the Fractale sys­tem in cer­tain ways that seem like a fas­cin­at­ing explor­a­tion of that character’s psyche, but then aban­dons said char­ac­ter pretty quickly. One of the points brought up early on by the Fractale sys­tem is that people liv­ing in it don’t exper­i­ence proper human con­tact. The whole point of the first epis­ode is show­ing the main char­ac­ter, Clain, and his baffle­ment and embar­rass­ment with meet­ing a real live in the flesh human girl, who pro­ceeds to strip in front of him. You would think this would there­fore be a run­ning theme through­out the show, but that was ignored pretty quickly. The closest it got was hav­ing another female char­ac­ter call Clain a per­vert in about 5 times per epis­ode. I’m guess­ing the show thought it was being funny by say­ing this? I dunno, it’s not like Clain was doing any­thing per­ver­ted any­way, was that the joke? It did try to cover basic human inter­ac­tions as part of the plot, but this was even more laugh­ably tackled. Over the course of the show, Clain sees these people he has joined up with, the Lost Mil­len­nium group, who are against the Fractale sys­tem, mow down old gran­nies. It offered the viewer two sides of the story, the Fractale Sys­tem and the Lost Mil­len­nium group that opposed it. But that one good scene was instantly deval­ued by ignor­ing it from there on in and intro­du­cing another eviler group of the Lost Mil­len­nium, mak­ing the mas­sacre of gran­nies from the group Clain were with seem like a totally cool thing in com­par­ison. This comes to a head towards the end where Clain joins in the granny gen­o­cide cam­paign, telling the Good Lost Mil­len­nium group that it’s OK that you kill people because you’re my friends! That’s just the themes seem to appear more often, but other parts of the plot make far less sense. The plot fin­ishes up on a rev­el­a­tion that God is not 16 years old, but actu­ally 10 and there­fore pure. What this had to do with any­thing I have no idea, but Fractale seemed to like telling us this in a very dra­matic fash­ion. The Fractale Sys­tem bad guys were equally baff­ling, also obsessed with pur­ity for whatever reason and gen­er­ally being a deranged bunch of lun­at­ics who filled their armies with sui­cidal gran­nies. For a show that seemed to be present­ing both sides of the argu­ments, surely you shouldn’t have the Fractale guys be such a bunch of lun­at­ics who like lick­ing the face of our brave heroine? Now this could all be fine in another series. You can be silly but still have a lot of fun. First off, Fractale isn’t fun, unless 10 ref­er­ences to Clain being a per­vert per epis­ode is your idea of a good time. But mainly, Fractale pre­tends it’s deep. It’s all about Themes and Issues and is Like Totally Ser­i­ous. But it brings up these points with no idea what it’s doing with them. It’s like it has taken ideas and scenes from other anime it’s seen, real­ised that these scenes make this anime great and stuck them into Fractale without real­ising why these scenes make that other anime great. You can have psychotic vil­lains who lick their pure heroines, but not in a show where your also try­ing to present a bal­anced view of those sides of the conflict. The reason I hate Fractale is because it offends the story-telling lover part of me. This is not some­thing that is appar­ent in the early epis­odes. This is some­thing that only rears its true ugly head in the later epis­odes where it tries to bring its plot to some sort of non­sensical con­clu­sion. It has taken a lot of dif­fer­ent plot points but has never con­sidered how they tie in together. It’s thrown out scene with Deep Mean­ing without real­ising that the mean­ing that scene pro­trays has noth­ing to do with whatever pre­vi­ous scenes the show has had, or even con­tra­dicts pre­vi­ous plot points. I’m guess­ing the Fractale Pro­duc­tion Com­mit­tee meet­ing went some­thing like this. –She was talk­ing to the Cart Driver, who turns out was actu­ally the main character! Yamakan: –Great Ideas! We’ll put them all in! I'm gonna come out and say that Fractale isn't that bad... and all the hate people have for it is kinda unjustified. The problem is that the show didn't manage to become the kind of masterpiece Yamakan wanted it to be, and that failed promise put the show in a very negative light. At least he's a man of his word, and "retired for the time being". It's a pity if he actually goes away for good because I still think he's still someone with plenty of talent, and even some of that does show in the flop that is Fractale. I've said this on more than one occasion, that I'd like to compare this series with Last Exile or Allison to Lillia, because I strongly feel that that is Yamakan's vision for Fractale. It isn't so much about the story, but it's about the fabulous combo of pre-industrial age technology meets young man's (or girl's) adventure. Series like these usually focus a lot more of the setting of the story, like the common people's way of life, community relationships, the environment, the history than most other shows do. This is probably Yamakan's take on the cincept, with a little furturistic element to it. And I really like that. Fractale shows the fun in a frugal and simple way of living, clean and honest community life, its conflict with furturistic technology, and a young man's adventure in his role and approach towards this conflict. Whereas the show fails hard on its execution and characters. First of all, there is too little revealed about the Fractale system itself, and we the audience are left with too many questions about practically everything that is going on. That won't be a problem if the characters are interesting enough to drive the show along, but they aren't. Clain is constantly being led by the nose by everyone around him, and his actions are always a result of how the story drives him, when it should be the other way around. Phyrne and Nessa are as mysterious as the Fractale system itself, and everyone else is there just to fill up the screen time. In the ending, there's wasn't a resolution or anything. It feels like it all happened as a matter of course. I'll keep this spoiler-free, but it's a happy, but really dumb ending. Another thing that's sorely missing from Fractale is satisfying animation, which is something I'm expecting to see from an anime using this concept. I'm totally expecting spectacular backgrounds, detailed characters or equipment, or at least smooth animating, but Fractale delivered none. I can't explain how disappointed I was. So in all, Fractale is okay. If you understand and love the concept of animes I was talking about, you'll enjoy Fractale to a certain extent. Otherwise, it probably isn't something for you. This show was actually awful. I really liked the colorful and simple style of the show so I looked more into it. I read the summary and thought it could be really okay. And then I made the mistake of watching it. It is the kind of overall bad that I cannot pin point just where they went horribly wrong. It is like that time you tried making dinner and you followed a recipe pretty strictly but it tasted awful and you didn't know what you did to ruin everything. All of the characters are faceless and not worth mentioning, I can't even remember any of the music and I was rewatching a few episodes today to reminisce the pain I suffered from enduring this god forsaken piece of crap. The story even had potential but the implementation was just wonky. I recommend this anime to anyone looking for an ironic marathon with a friend. The two of you can laugh at how bad it is for weeks to come. Of the entire Winter Anime list, Fractale instantly caught my attention, perhaps because of all the words written on the list, “fractal” is the term that I have encountered several times. I enjoy this show because it has some in-depth meanings on how technology impacts humans and apparent socio-political implications. Also, I find it unique and refreshing in its own simple ways. In terms of character design, I find them pleasing but not really fantastic. However, you can surely recognize the character development. I particularly like Nessa, I thought she is going to be annoying doppel--data or memory that interacts like human, who will screw up on everything, but it turned out that she is lovable, and despite her age I find her more intelligent and sensible than Phryne. As for Cain, I truly enjoyed his character, I witnessed how he grows up from being immature young boy to a mature young man. Overall, at the end of the series I sensed that the characters grew into me, because even the secondary characters like Sunda and Enri are worth mentioning when you talk about Fractale. Artwise, it has nice and friendly ambiance. However, I find the color tone and setting somewhat old-fashioned, but I guess that what makes it unique and easy to follow. The setting is supposed to be futuristic however they incorporated farms, valleys and plateaus, perhaps that's why they used that "classic" a ambiance. On the other hand, I almost lost my enthusiasm after seeing the first episode; the show seemed to be too shallow and carefree for me—that time I wanted to see something that is extremely thought provoking and emotion driven. Little did I know, behind light ambience is where the irony hides. It is good that I did not drop it right away and stick-around until episode three, because that is where the story begins to unfold. A quick snippet of Fractale is it tells the story of a young boy named Clain. One day, he saw a temple girl named Phryne being chased by three armed people. Eventually, Phryne managed to get away from her chasers. After seeing her wounded, Clain brought her home for treatment and also helped her to hide from those who are trailing her. The incongruity and the bulk of the story is in the title itself; Fractale system pledges a life of pure relaxation and technology-driven lives. However, due to the overly convenient lifestyles, people do not talk to each other and do not work for a living anymore. Further, the extreme dependency in technology is turning people into less “humans”. For instance, families in Fractale System do not live together anymore, and people just spend their days stagnant. Now, if we are going to look at the definition of fractal, it means rough, fragmented geometric shapes and reduced-size exact copy of the whole—opposite to the symmetric and smooth lifestyle that Fractale system offers. We can see that Indeed, Fractale system is the provider of the “whole package” of convenience to its citizens, however this supposedly “whole” is actually in a form of the reduced-size of the real thing. Aside from that, instead of being part of the entire picture, people continuously sprout out as isolated entities of the picture, or simply the petite-sized reset of the Fractale system. I truly believe that the author successfully incorporated the characteristic and symbolism of fractal in the story. The last episode is kind of rushed. I really think it's a pre-mature last episode and it's not the type of ending that I'm expecting however it didn't disappoint me. This is just purely my opinion though. Now it's up to you to find out what you think about the Fractale.